To represent actual Shopping Cart of a Magento-based store, OroCRM provides records of the “Shopping Cart” entity. If, by the moment of synchronization with your Magento-based store, a customer has added some items to cart, a Magento cart is created in OroCRM. 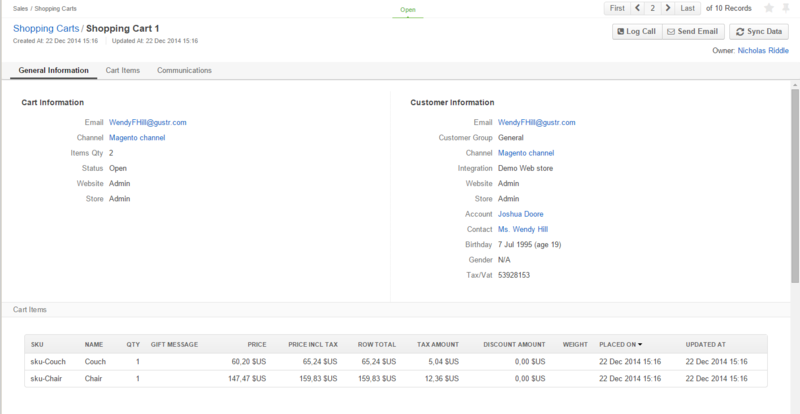 The record is used to save the cart details, such as number of items, items description, purchase status, etc. The “Order” records represent shopping carts, for which an order has been submitted. If two-way synchronization has been enabled` you can process carts and submit orders from OroCRM as described below. Go to the view page of a Magento customer. If you don’t complete the order placement procedure, a shopping cart will be created. If you submit the order from the Admin Panel, this order will be created in OroCRM. Go to the view page of a Shopping Cart with status “Open”. Click the Place and Order. Enter the Admin Panel of your Magento shop and submit the order in your Magento Store. Be careful not to confuse the cart status and step of the related workflow. For example, a cart at the step “Contacted” can still have the “Open” status (items in the carts have not yet been bought). The only action available from the grid of Shopping Carts and Orders is to open the view pages of their records by clicking the icon. Perform actions specified in the Communication & Collaboration section of the Shopping Cart entity configuration. See step 4 of the Create an Entity action description..
Synchronize Data, i.e. upload the latest information for the cart/order from Magento and back (as defined by the synchronization settings). Information for all the carts/order is updated once in a predefined period (default value is 5 minutes). However, it is strongly recommended to update a specific Cart record before you perform any actions with it.